The Shih Tzu is a wonderful breed of dog, intelligent and friendly to all. If raised and trained properly he can make a great pet for adults and children alike. 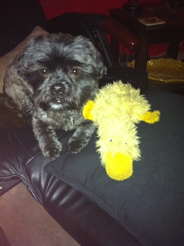 Good Shih Tzu training will take into account why the little dog is bred. After all you need to know his genetic quirks and pre disposed behaviors then you can cater your training methods to incorporate them. It will make your training sessions so much easier. The Shih Tzu was not bred to do a job but as a companion. His ancestors were gifts to royalty and companions to Buddhist Monks. Back then he was known as the lion dog. This little dog earned his living by looking pretty so will often have little work drive. He does love treats though, which is great because this food motivation is exactly what you can use to train him. Social needs are often overlooked when people talk about dog training, yet they are extremely important. If you are bringing home a Shih Tzu puppy, or even older dog, it is important that you keep his social circle as wide and positive as is possible. Generally a happy little dog, who if raised well, will greet strangers with enthusiasm yet the Shih Tzu, can also become fearful of new situations and strangers. He needs to be socialized early in his life. So introduce him to people of all ages plus other animals and all the sounds you can think of, fireworks and thunder inclusive, early on. Make everything fun and act as though all is normal, that way your dog will be naturally confident in every new situation, because he will take the lead from you. If he shows any fear do not draw attention to it because he will then believe that such fear is founded, just be calmly confident and allow him to get used to the situation without direct confrontation. For instance if he is scared of strangers you can ask people to talk to you and ignore the dog. This will allow him to get used to them in his own time with no pressure. If you share your life with a Shih Tzu then you will need to put down some guidelines to how you live. The little dog can develop a sense of entitlement and even become bossy if allowed to. Generally though he is an easy going and undemanding little companion dog who loves people, including children, and will sell his soul for a cuddle. The most important thing about Shih Tzu training is that you are fair and kind to him, yet you have to think quickly because he is bright as a button. Everything you do with him has to be positive. If you punish a Shih Tzu he will be both offended and soon begin not to trust you at all. Eventually punishment will break down a potentially wonderful relationship. Punishment serves no purpose. Your little dog will not learn from it simply because he will never associate the punishment to his own behavior. This is obvious when you think of it because to punish a dog he must have already done the crime. Each time he carries out the behavior that he will be punished for he is learning to be better at it, he is forming a habit and all the punishment in the world will not break a habit after it has been formed. 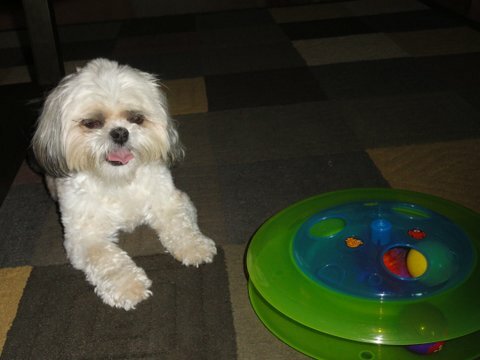 You have to train your Shih Tzu to carry out a different behavior altogether instead. You may have heard the terms ‘Alpha’ or ‘Dominance’ used in dog training. This training style is inaccurate and best avoided. It is too close to punishment and force based methods. Look out for the term positive reinforcement instead; it is the only training method that is scientifically proven to be best for your Shih Tzu and your mutual healthy relationship. Positive reinforcement is the right way to train your dog. By shaping any behavior which you would like him to repeat, using praise and treats including toys, you will get the very best from your dog. The idea of positive reinforcement is that you reward every behavior which you would like your little dog to repeat. It is also vital to ignore any behavior that you find unhelpful, ignoring a useless behavior will make it extinct. Reacting to annoying behaviors, even if you react negatively, will encourage your little lion dog to repeat the behavior. For instance the Shih Tzu can easily learn to jump up for attention which can become annoying. If you give him attention for jumping up the little dog will do it again. He will not be concerned whether you pushed him off and said no – or whether you gave him a cuddle. Both reactions provide him with attention and your Shih Tzu loves attention. So why not utilize this and keep a pocketful of tiny treats around at all times. Then if you turn your back on the scrabbling dog each time he jumps up, but then give him attention and a treat if he approaches you but keeps all his paws on the ground you will soon see the less helpful behavior fade away. This principle used alongside the knowledge that punishment won’t work will make all of your Shih Tzu training sessions successful. Keep these points at the forefront of your mind and you will soon have a perfectly trained Shih Tzu.